Toronto REI club meetings are held on each month.Learn from the Canadian Experts the tactics, skills, and investing methods it normally takes others a lifetime to learn. Our radically different approach is intense, immersing, interactive, and gives you actionable knowledge you can start using the instant you're done. PREIG Canada has helped thousands of Canadian real estate investors, build wealth and exceed their goals through investing in Canadian real estate. We provide Professional real estate investors group (PREIG) Canada members the knowledge, education, current information, forgivable grants, LIVE Eye Witness field trips to build the confidence to apply proven real estate investing and buying strategies in Canadian real estate. Professional real estate investors group (PREIG) Canada Membership is the key that opens the door to education and a powerful community of Canadian real estate investors, resources, support and network. Whether you are a newbie or you are an advanced investor preparing to purchase you’re next door; Professional real estate investors group (PREIG) CanadaMembership may assist you in achieving these investing goals. 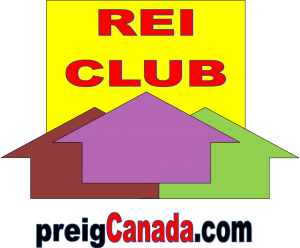 The cost of Toronto REI Club meeting is membership is $349.98 per year/per Canadian real estate investor. This is an opportunity you must share with your friends, family and colleagues. If you want more out of life more wealth, more happiness, more fun then you MUST get them to one of the upcoming PREIG CANADA'S Monthly Real Estate Investors association's mentoring, support and networking meeting. Not a Member of Professional Real Estate Investors Group (PREIG) Canada? Join the annual membership now ! Change your financial life forever! This presentation is intended for information purposes only and is not intended as a substitute for legal or professional advice.Seek qualified professional assistance on your personal matters.